An air conditioner seems as if it cools your home’s air, but it actually makes your home less warm by removing heat from the indoor air and transferring that heat to the outdoor air. Heat is extracted from the home by passing indoor air across a refrigerant coil in the indoor unit. Refrigerant lines then carry the heat to the outdoor unit, where it is released into the outside air. The cooling cycle continues until the indoor temperature reaches the thermostat setting. SEER (Seasonal Energy Efficiency Ratio) is a system for rating the efficiency of cooling equipment. The higher the SEER rating, the less your unit will cost to operate. HSPF (Heating Seasonal Performance Factor) is a measurement similar to SEER, but it measures the efficiency of the heating portion of a heat pump. What size equipment do I need for my home? The only reliable way to determine the size that best matches the needs of your home is to have a trusted AIRTEAM associate perform a load calculation, which takes into account the square footage of your house, the insulation value of your windows, the amount of insulation in your walls and roof and many other factors. Also, a heat pump can be an effective add-on option to use in conjunction with an existing gas furnace. With this dual-fuel option, the two systems share the heating load, but never function at the same time. Each system operates when it is most cost effective. The heat pump will be the primary heating and cooling system. However, when the temperature drops below the heat pump’s ability to operate as efficiently as the gas furnace, the gas furnace will take over until the temperature rises enough for the heat pump to operate more efficiently. Why should I zone my house? A zoning system is designed for the many ways you use your home. Maybe you’re caught up in family “thermostat wars?” Or perhaps you have unoccupied areas that do not need conditioning? A Lennox® zoning system allows you to divide your home into separate areas, giving you the comfort and control you’ve always wanted. A properly designed zoning system can save you hundreds of dollars in energy costs each year. Zoning divides the home into different areas and comfort into different levels, giving you more choices and control than ever before. How can I confirm the model and serial numbers for my cooling system? You can find the model and serial numbers (M/N and S/N) for your furnace by removing the top-front service panel and looking to the left side of the interior cabinet or the top of the blower deck, depending on whether your system is an 80% or 90% AFUE unit. Also, the orientation (horizontal or vertical) and flow direction (down or up) of your furnace may impact the location of the information. Why is my system freezing up? There are several factors that can cause system freezing. Most need to be corrected by AIRTEAM. One thing you can do to prevent or correct this problem is to make sure the filter is clean or replaced. You can check to see if airflow is restricted. After replacing or cleaning the filter, you can speed up the thawing process by turning the system off and turning on the fan. If you have a heat pump system, you can try turning the system to heating mode until the ice has melted. After the ice has melted, switch the system settings back to normal. 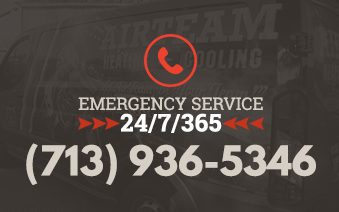 If the system refreezes, contact AIRTEAM to correct the problem. In some cases, freezing is caused by a leak in the refrigerant lines. Weak solder joints, friction from piping rubbing or vibrating against an object, open valves or loose fittings are all factors that can cause leaks. When determining whether to have the system repaired or replaced, the age of the system and the nature and location of the leak are important considerations. Over time, the evaporator coil will become dirty. When this happens, you will begin to lose airflow, slowly enough that you probably would not realize it until it freezes up or cooling performance is compromised. At this point, you will need to contact AIRTEAM to correct the problem. A blower motor not running at the proper speed or not running at all is another factor that can cause freezing. Motor operation may be intermittent, starting at full speed and slowing down after it heats up. Or, a relay could cause it to start one time and not the next. In either case, you will need to contact AIRTEAM to correct the problem. Matched system design All outdoor cooling units are specifically designed to work with matched indoor units for optimum efficiency and performance. Air conditioner and heat pumps may “work” with other indoor units, but the result is a definite compromise in overall system performance. Design advances In recent years, indoor blower coil units have undergone numerous design advances—especially in the areas of air handling performance, filtering efficiency and operating sound levels. A new outdoor unit will also include the latest design advances. Higher cooling and heating efficiency The cooling and/or heating efficiency rating assigned to a given air conditioner or heat pump is based on matched system performance. While you may gain higher efficiency by replacing only the outdoor unit, the efficiency levels (and savings) will not be as high as with a matched system. Equipment age If an air conditioner or heat pump outdoor unit is 10 years old and needs to be replaced, the indoor unit is just as old and has been subjected to the same amount of wear and tear. Replacing both units means you won’t have to replace the indoor unit in a short time—you’ll have years of service from both units. New warranty A new unit also gives you a new product warranty. Replacing the indoor unit at the same time as the outdoor unit gives you added peace of mind, knowing the new warranty covers the entire system. Should I be concerned about new energy-efficiency standards? Why should I choose a Energy Star product for my home? How can I control energy costs? Heating and cooling your home can represent as much as 44% of your utility bill. * With high efficiency ratings and innovative, industry-leading technology, Lennox® home comfort systems can go a long way toward reducing these costs. Maintenance You can ensure your system operates at peak performance by scheduling annual preventative maintenance checks. Zoning A zoning system can drastically lower your heating and cooling costs. With zoning, you no longer have to pay to heat or cool areas of your home that are rarely used. Programmable Thermostats According to the Department of Energy, a programmable thermostat can reduce your heating costs by up to 35% and cooling costs by up to 25%. For more energy-saving solutions, contact your local Lennox Dealer. Consistent comfort Two-stage heating eliminates the temperature swings associated with standard furnaces, regulating temperature to within as little as one degree of the thermostat setting. Quiet operation Two-stage furnaces start in the first stage, when the amount of heat required is lower, instead of reaching full capacity all at once. That means there’s no sudden “kick” or blast of air. Improved air filtration Low-speed operation allows your filters to capture more contaminants (because air is constantly passing through them), so you can breathe easier. Furnaces are rated by the Annual Fuel Utilization Efficiency (AFUE) ratio, which is the percent of heat produced for every dollar of fuel consumed. Like the miles-per-gallon rating on your automobile, the higher the AFUE rating, the lower your fuel costs. All furnaces manufactured today must meet at least 78% AFUE. If your furnace is 10 – 15 years old, it very well may fall below the current furnace minimum and waste energy. Furnace technology has advanced significantly in recent years. Modern furnaces are designed to provide more even and efficient heating than past furnaces, which can impact both how your system operates and what you notice about your system. Electrical efficiency Variable speed motors can actually save you money on your energy bills, as they consume less electricity than standard motors. Cooling efficiency Variable speed technology also means you will gain heating efficiency or AFUE. Zoning Variable speed motors are excellent for zoning, which allows you to customize your comfort in different areas of your home and control your energy bills. Air quality A variable speed motor can also help clean the air in your home. When the fan is in constant operation (indicated by the “Fan” setting on your thermostat), the motor will continue to slowly circulate air, allowing filters to capture more contaminants. Can I use my chimney with my new furnace? Furnace technology has advanced significantly in recent years, raising concerns over chimney use. As a result of changing technology, many existing masonry chimneys aren’t able to meet the specific demands of new furnaces. There are several reasons for this furnace-chimney incompatibility. First, the size of the chimney can be an issue. Modern, higher-efficiency furnaces transfer more heat into your home and less heat up the chimney than older, less-efficient units. While this means more efficiency for your energy dollar, it also means that the existing chimney might be too large for the new furnace. The result could be improper ventilation of flue products, which can cause condensation problems inside the chimney. Other considerations include chimney height and location, proper lining and condition of the chimney. Building codes must also be kept in mind to ensure proper draft in the chimney for adequate ventilation. “Indoor air quality,” or IAQ, is a relatively new topic in environmental safety. While a lot of attention has been placed on outdoor pollution over the past few decades, the focus on indoor air quality is just beginning. The quality of a home’s air mainly has to do with the amount of pollutants inside, but it’s also determined by humidity and ventilation levels. The U.S. Environmental Protection Agency has found that concentrations of pollutants can be up to 100 times higher indoors than outdoors. The American Lung Association estimates that most people spend 90% of their time indoors, so clean indoor air is very important. Many everyday household items contribute to poor indoor air quality. Compounds found in carpeting, furniture, upholstery and drapery fabric consistently emit gas or fumes. Other sources of pollutants can include, but are not limited to, cleaning agents, paints and personal care products. Also, newer homes that are tightly sealed for energy efficiency tend to limit air circulation, which can contribute to a buildup of contaminants. Likewise, things like weather stripping and storm doors keep stale air in and fresh air out. What can I do myself to enhance my home's air quality? 1. Store household cleaners, paint solvents and chemical products in tightly sealed containers. If possible, keep them outdoors. 2. Clean and vacuum at least once a week. 3. Regularly wash bed linens and stuffed toys. 4. Keep windows closed when pollen, pollution and humidity levels are high. 5. Ask you local Healthy Climate dealer to test the air in your home for dust, pollen, chemicals and other pollutants (data is evaluated by an independent testing agency). 6. Make sure your home is properly ventilated. (Modern homes are well insulated and sealed to conserve energy, which means airborne pollutants have no way to escape). 7. Keep humidity levels within a healthy, comfortable range to prevent growth of mold and mildew (30% – 60%). 8. Avoid using scented deodorizers and odor-masking air fresheners, which may cause toxic chemicals. 9. Have your HVAC system regularly inspected to make sure it is clean and in good operating condition. 10. Choose furnishings that emit the smallest possible amount of chemical vapors. 11. Do not allow smoking inside your home and make sure all gas appliances are properly vented. Sometimes, poor ventilation in a home causes unpleasant odors. Your local Lennox dealer can inspect your home comfort system to determine if this is indeed the problem. The PureAir™ air purification system uses photocatalytic technology to remove and destroy odors from sources like cleaning supplies, solvents used in carpeting or furniture, paints, cooking smells and pets. The Healthy Climate Carbon Clean 16 media air cleaner has a carbon-coated fiber matrix that can control odors. A high-efficiency particulate air (HEPA) system can also clear away odors when equipped with its optional carbon canister. To find out which indoor air quality products are right for you, contact AIRTEAM today. Why is ventilation important for proper indoor air quality? At one time, it was possible to achieve natural ventilation in our homes by simply opening a window. However, with growing concerns about rising energy costs, we have been busy making homes “tighter” from an efficiency standpoint. Armed with weather stripping and caulk guns, we have eliminated air leaks from our homes. Unfortunately, that means contaminants have no way to escape. Pollutants in your home’s air can cause poor indoor air quality, which in turn may cause dizziness and headaches, plus aggravate allergies and asthma. That’s why Lennox offers ventilation systems that help remove contaminants by exchanging stale, recirculated indoor air with fresh, filtered outside air. ENERGY STAR Partner of the Year As a four-time winner of the ENERGY STAR® Manufacturing Partner of the Year award—the first winner in the heating and cooling industry—Lennox offers a complete selection of high-efficiency systems that can save you hundreds of dollars every year on your utility bills. Worry-Free Warranty Coverage On top of exceptional quality you get when you purchase a Lennox® heating or cooling system, you also have the comfort of knowing it’s backed by one of the best warranties in the business. For select high-efficiency systems, extended warranty protection is available when you register your product online.